John Canton FRS (31 July 1718 – 22 March 1772) was a British physicist. He was born in Middle Street Stroud, Gloucestershire, the son of a weaver John Canton (b. 1687) and Esther (née Davis). At the age of nineteen, under the auspices of Dr Henry Miles, he was articled for five years as clerk to Samuel Watkins, the master of a school in Spital Square, London, with whom at the end of that time he entered into partnership. In 1750 he read a paper before the Royal Society on a method of making artificial magnets, which procured him election as a fellow of the society. 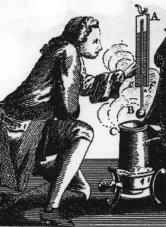 In 1751 he was a recipient of the Copley Medal "On account of his communicating to the Society, and exhibiting before them, his curious method of making Artificial Magnets without the use of Natural ones." He was the first in England to verify Benjamin Franklin's hypothesis of the identity of lightning and electricity, and he made several important electrical discoveries. In 1762 and 1764 he published experiments in refutation of the decision of the Florentine Academy, at that time generally accepted, that water is incompressible. In 1768 he described the preparation, by calcining oyster-shell with sulphur, of the phosphorescent material known as Canton's phosphorus. His investigations were carried on without any intermission of his work as a schoolmaster. He died in London aged 53 of dropsy. He was the recipient of letters from Thomas Bayes, which were then published by the Royal Society. ^ Canton, John (1761–1762). "Experiments to Prove That Water is Not Incompressible". Philosophical Transactions. 52: 640–643. doi:10.1098/rstl.1761.0105. JSTOR 105681. ^ Canton, John (1764). "Experiments and Observations on the Compressibility of Water and Some Other Fluids". Philosophical Transactions. 54: 261–262. doi:10.1098/rstl.1764.0045. JSTOR 105560. ^ Canton, John (1768). "An Easy Method of Making a Phosphorus, That Will Imbibe and Emit Light, like the Bolognian Stone". Philosophical Transactions. 58: 337–344. doi:10.1098/rstl.1768.0045. JSTOR 105793. This article incorporates text from a publication now in the public domain: Chisholm, Hugh, ed. (1911). "Canton, John" . Encyclopædia Britannica (11th ed.). Cambridge University Press. Daniel Gabriel Fahrenheit FRS was a Dutch-German-Polish physicist, inventor, and scientific instrument maker. Fahrenheit was born in Danzig/Gdańsk, a predominantly German-speaking Hanseatic city in the Pomeranian Voivodeship of the Polish–Lithuanian Commonwealth, but lived most of his life in the Dutch Republic (1701–1736) and was one of the notable figures in the Golden Age of Dutch science and technology. William Henry was an English chemist. He was the son of Thomas Henry and was born in Manchester England. He developed what is known today as Henry's Law. Philosophical Transactions, titled Philosophical Transactions of the Royal Society from 1776, is a scientific journal published by the Royal Society. In its earliest days, it was a private venture of the Royal Society's secretary. It became an official society publication in 1752. It was established in 1665, making it the first journal in the world exclusively devoted to science, and therefore also the world's longest-running scientific journal. The use of the word philosophical in the title refers to natural philosophy, which was the equivalent of what would now be generally called science. Sir Charles Brian Blagden FRS was a British physician and scientist. He served as a medical officer in the Army (1776–1780) and later held the position of Secretary of the Royal Society (1784–1797). Blagden won the Copley Medal in 1788 and was knighted in 1792. A cryophorus is a glass container containing liquid water and water vapor. It is used in physics courses to demonstrate rapid freezing by evaporation. A typical cryophorus has a bulb at one end connected to a tube of the same material. When the liquid water is manipulated into the bulbed end and the other end is submerged into a freezing mixture, the gas pressure drops as it is cooled. The liquid water begins to evaporate, producing more water vapor. Evaporation causes the water to cool rapidly to its freezing point and it solidifies suddenly. Charles Lyttelton (1714–1768) was an English churchman and antiquary from the Lyttelton family, who served as Bishop of Carlisle from 1762 to 1768 and President of the Society of Antiquaries of London from 1765 to 1768.